A 1959 Ferrari 250 GT LWB California Spider and 1962 Ferrari 400 Superamerica are the top cars offered at the Gooding 2015 Scottsdale Auctions in Arizona. The mid-January auctions will feature a wide variety of over 120 automobiles but the 20 cars estimated to achieve in excess of a million dollars each are mostly Ferrari, Porsche, Mercedes Benz and Shelby cars. See also: 2015 Gooding Scottsdale Classic Car Auction Results. A 1959 Ferrari 250 GT LWB California Spider is estimated to achieve $8,000,000 to $10,000,000 at the Gooding & Co 2015 Scottsdale Auctions in Arizona. This easily makes it the most expensive car on offer at this two-day event. The legendary California Spider is equal parts performance and beauty, and perceived by many to be one of the most beautiful Ferraris ever built. This road-to-race model was designed primarily for export to American clients, who enjoyed the performance and competition pedigree of the 250 GT but wanted to combine it with an open-air factor, perfect for the long scenic coastal drives of California. 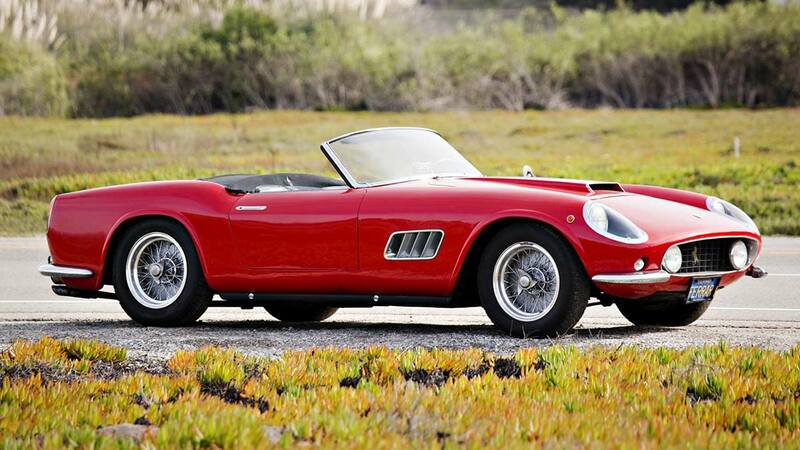 The 1959 Ferrari 250 GT LWB California Spider on offer has an exceptional long-term ownership history. Since 1969, it was part of the late Jack Castor’s collection in Half Moon Bay, California, and rarely shown in public. This California Spider, the 27th of only 50 long-wheel base versions ever produced, is finished in Ferrari “Rosso Rubino” red with its original black leather interior. The car is in a well-maintained condition but has never been restored. The 1962 Ferrari 400 Superamerica SWB Coupe Aerodinamico with an estimate of $4,000,000 to $5,000,000 is expected to achieve the second highest result at the Gooding & Co 2015 Scottsdale Auctions. Purposefully designed and put into production to exude exclusivity, the Superamerica was among the apex of desire for Ferrari enthusiasts. This 1962 example of the bespoke series is the 12th of 17 Series I 400 Superamericas and is one of only seven Aerodinamico coupes outfitted with a left-hand drive and covered headlights. This 400 Superamerica in “Bianco” white Pinninfarina coachwork over grey Connolly leather interior was completely and authentically restored circa 2005 by leading Ferrari specialists Bachelli and Villa, which earned the car a factory Certificate of Authenticity in 2007. The 2015 Scottsdale Auctions of classic and collectors cars by Gooding & Co will he held in Arizona on January 16 and 17, 2015 at 11 am at the Scottsdale Fashion Square, 4700 N. Scottsdale Road, Scottsdale, AZ 85251. As usual, the top competition for highest result achieved at the Arizona auctions in mid-January 2015 will come from RM Auctions and Bonhams. Both also have top Ferraris and other super cars on offer.